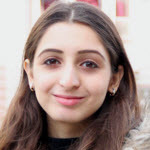 Rashna Razdan is a user experience designer working at Zscaler in San Jose, California. She has a degree in Computer Engineering and several years of industry design experience working both at design agencies and in-house. She loves her job where she leads the design effort on several complex data-heavy projects. She enjoys the challenge of tackling unwieldy problems by way of ideation, research, and visual/interaction design. When Rashna is not designing interfaces she can be found at the gym trying to improve her main lifts or in nature honing her photography skills.